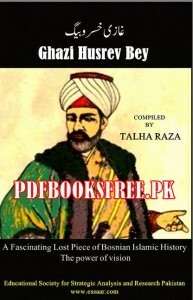 Ghazi Husrev Bey or Gazi Husrev Beg, A Fascinating Lost Piece of Bosnian Islamic History The power of vision. Compiled by Talha Raza and Presented by Educational Society for Strategic Analysis and Research Pakistan (www.essaar.com) . Our Islamic history is full of examples of scarifies, devotion, power and success, but this lost part of history has very signiﬁcante features to understand for those, Who Want to achieve their ultimate visions. To achieve visions, life doesn’t matter, the only thing which matter is, ultimate purpose and excellence. Ghazi Husrev Bey laid such a foundation With purity of faith and excellence through his mission and vision, which you will not find any where in the history of this World. This vision gave leadership, strength and guidance on every phase of disaster, every turn of horrible mascaras and on every era of turmoil for Muslims in Bosnia. Almost everyone from the Islamic Movements, mentors, leaders and members Who gave their lives for the sake of Islam and Muslims of Bosnia, Were connected directly or indirectly to the vision of Ghazi Husrev Bey. Ghazi Husrev Bey (1480-1541) was born in Serres / Serez (Aegean Macedonia), Greece, in a house of Bosnian Muslim father “ Farhad Bey” ( an immigrant from the Trebinje region) and a Turkish mother, who was the daughter of Sultan Beyazid II’. His Father was serving as a Governor in Serres / Serez (Aegean Macedonia). His name was based on ottoman honorific epithet, “Ghazi”, and the royal first name as, “Husrev”. Based on his outstanding bravery and military expertise, he was awarded by the title of “Ghazi” “ A Hero”. This research work provides comprehensive historic information about the life and work of this great Muslim commander. Visit the below mentioned links to read online and also free download the complete book in Pdf format for offline reading and references.